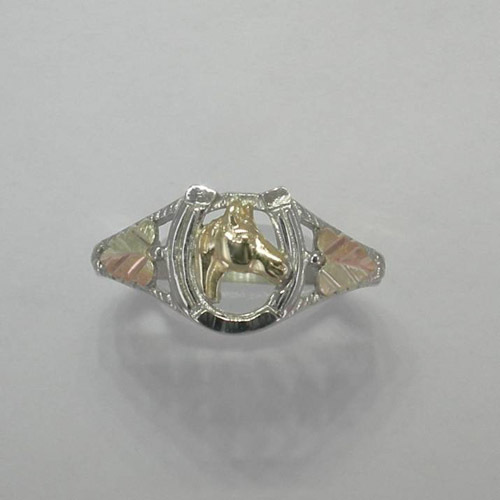 Desc: Black Hills Gold Sterling Silver tri-tone horse head in horseshoe ring. 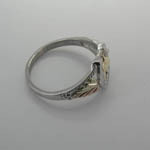 The ring is fashioned from Sterling Silver. The horse head is gold. The gold horse head is mounted inside the Sterling Silver horseshoe. One leaf is mounted on each side of the horseshoe. Each leaf is half Rose gold and Green gold. Sterling Silver grape clusters are mounted on the outside edge of each leaf. 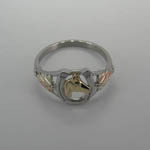 The ring has bright polish and textured finishes and is made in the United States of America.